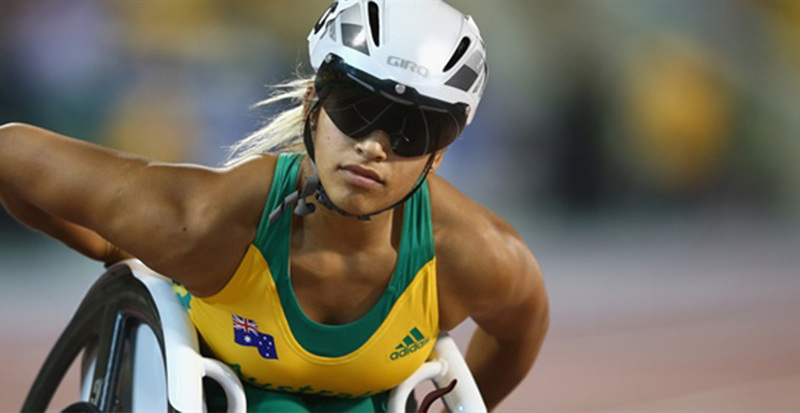 Madison de Rozario is world champion for the first time, after storming past the race leader in the closing stages to win GOLD in the T53 wheelchair 800m at the IPC Athletics World Championships. Positioned amongst the pack as athletes approached the final bend, de Rozario gutsily moved off the rail and into the middle of the track, providing her the space to sprint home, steal the lead and win in a time of 1:53.86. “Everyone started to spread out with about 250m to go and I knew that every girl out there could come home strongly, so I took a risk and went wider earlier and it paid off. To be honest, I was just chasing a medal because that’s what I delivered two years ago in Lyon, so to get this result is amazing, I didn’t expect it to play out like this at all,” de Rozario said. “I’ve got the 5000m to come and that’s what I came here for. This is a bonus. It’s a completely different race though, much more tactical. Believe it or not, for us the 800m is a bit of a sprint and I’m looking forward to a jog pace in the longer event. The longer distances are still pretty new to me, so I’m keen to see how I will go. In a great result for the Australian Flame, the BRONZE medal was won by de Rozario’s training partner Angela Ballard (NSW, 1:54.08), with Hongzhuan Zhou (CHN, 1:53.95) winning silver. Ballard’s championships has been impressive, with the six-time IPC Athletics World Championships starter also winning gold medals in the 200m and 400m. Brayden Davidson also won BRONZE on day six. Dedicating the medal to his grandmother, who encouraged him to become involved in athletics as a child, his podium finish came after her soared 5.44m (w: 0.0) in the men’s T36 long jump for athletes with cerebral palsy. “I was stoked with that. It’s close to my best and I can’t ask for much more than that in an environment like that. I was pretty nervous,” Davidson said. Davidson has been a fixture of Athletics Australia’s junior para-athletics program, attending the annually hosted Under 17 Development Squad camp on three occasions. He believes the lessons he learned as part of this program on dealing with pressure assisted him in his performance tonight. “The junior performance program has helped me so much to prepare for this. I’ve been to a few camps now, and we do lots of sessions about dealing with pressure, nerves and excitement and I think that helped me because I was in the medals from early on, which made me worry a little about what might happen from there,” Davidson added. Erin Cleaver (NSW) and Taylor Doyle (NSW) were 4th and 5th placed respectively in the final of the T38 long jump for athletes with cerebral palsy. Cleaver, who was in the bronze medal position coming into the last round, leapt to a new personal best of 4.45m (w: -0.1), with Doyle jumping 4.28m (w: +0.2). Clocking 11.20 (w: -0.3), Gabriel Cole (SA) crossed 5th in the final of the men’s T47 100m for arm amputees, as Michal Darus (POL) won gold in a championship record time of 10.73. Advancing to the final after placing second in his semi-final, Sam McIntosh (Vic) clocked 18.11 (w: -0.6) to place 5th in the T52 wheelchair 100m. He will now turn his attention to the longer one-lap event. Isabelle Hampton (NSW), who is competing with the Australian Flame for the first time, threw a personal best of 36.04m to place 6th in the final of the T13 javelin throw for athletes with visually impairments. Throwing a personal best of 5.20m in the second round, major championship debutant Kobie Donovan (Qld) finished 7th in the F40 shot put for athletes of short stature. Her result is also an Australian and Oceania record. Returning to the track after becoming world champion in the 100m, Scott Reardon (NSW) crossed the line in an Australian record time of 25.27 (w: +1.1) to progress to the final of the T42 200m for leg amputees. Richard Whitehead (GBR) advanced as fastest in 24.10.